Zombies, Run! is an innovative, fun way to make running a pleasure or the long work day pass quickly. Would you run faster, if zombies chase you? Would you get out of your comfy gaming chair and go for a run, if you’re playing a zombie apocalypse interactive game? Do you need a refreshing perspective for the dreaded grind on the treadmill? Do you find it painful to listen to your co-workers drone on and on? Zombies, Run! could bring some excitement to some otherwise painful tasks. I took Zombies, Run! for a spin today, and it was a blast. I don’t run because it gives me a high. I run, so I can eat french fries. For me, it takes a lot of energy just to go out and do it. But, Zombies, Run! made it an interesting run. My focus was not how much time was left in my run or how awful it is to run uphill. There was a story. There were supplies to gather. There were zombies. And, the zombies chased me. The Zombies, Run! iPhone app starts with stark, military-inspired graphics to give you the story’s background. Overall, it was a simple start. You just need to activate zombie chases, and you are warned to be careful of your surroundings during a zombie chase. You choose your playlist from your iPhone. If you do not have a running playlist, make one before you start. The default is purchased material. My most recent purchase was Mayer Hawthorne, and his tunes are better suited to a different activity. You touch start, and your Zombies, Run! interactive experience begins. The Zombies, Run! iPhone story revolves around a township where zombies have nearly taken control. Your job is to bring supplies and logistical support to rescue the remaining humans. Your helicopter goes down unexpectedly, you reach the ground, and you run to the base. You receive tactical guidance from the remaining humans who bring other elements of the story to your attention. As you run, you pick up supplies on the way. A voice interrupts your playlist to let you know what you’ve collected. The Zombies, Run! remaining humans periodically speak to you to guide you away from zombies and to coach you through zombie attack sprints. Throughout the run, you can glance at the top of the screen to find your pace, time, and distance. At the end of your run, you can leave the mission open, or you can end it. If you leave the mission open, then you could continue your run later. Once you end your mission, the results are logged–supplies collected, distance, pace, and a log of important mission events. You can tweet your results with two touches. For parents, spouses, and significant others, it may be the perfect gift to get your beloved gamer off the computer and pounding the pavement. I can’t wait to unlock the next part of my mission during my Zombies, Run! tomorrow. 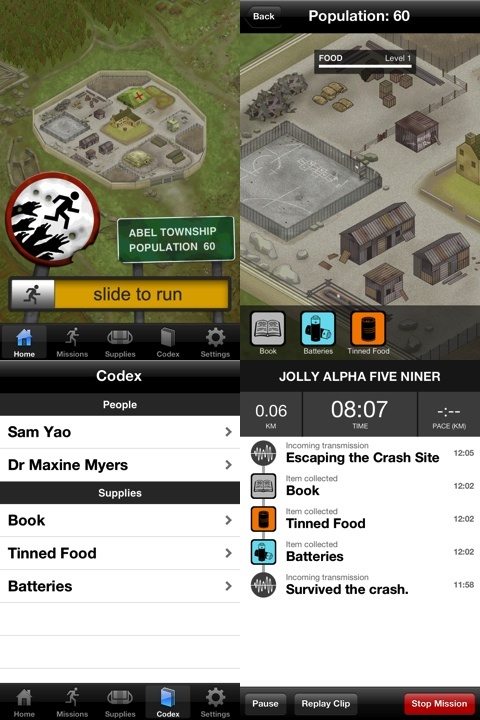 AppSafari review of Zombies, Run! was written by Jenni Ward on February 28th, 2012 and categorized under App Store, Featured, Fun, Games, Health. Page viewed 6330 times, 1 so far today. Need help on using these apps? Please read the Help Page. Does the Zombie Chase work if you use the app on a machine (ie Eliptical) or does it work best if you are running/jogging outside.